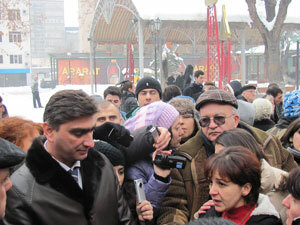 It is nothing new for Armenians to see their politicians accused of corruption. Usually the accusations have little effect and in a few instances people may change jobs but they rarely get punished. In July 2012, however, a court in the United States returned a guilty verdict against Vardan Ayvazyan, a former environment minister and current Member of Parliament for soliciting a $3 million bribe and ordered him to pay $37.5 million in compensation to a US mining company, which following its refusal to bribe lost its license in Armenia. Ayvazyan is also chair of the parliamentary Standing Committee and a prominent representative of the ruling Republican Party. The news of his conviction was reported in the Armenian press only in September. In Armenia the police and the judiciary are among the top institutions that people believe are most corrupt. So, we don’t expect those in power to be brought to justice very often. Impunity is a big problem. It will be very surprising if this politician has to pay a penny in compensation, much less lose his job. Today, despite the ruling in the US and all the evidence presented in the court there, there is little political will in Armenia to follow up on the case. This is a significant opportunity to show that the rule of law is important and applies to everyone. It perpetuates the idea that those who are corrupt and use their positions of power for private gain will not be held to account. Transparency Armenia has asked the Committee on Ethics of the National Assembly of Armenia to look into the case to decide if the behaviour of the parliamentarian lived up to ethical norms and standards. In terms of other activism, there is a campaign running on Facebook demanding Vardan Ayvazyan’s resignation and more than 500 people have signed to date. Of particular concern was Ayvazayan’s public contempt for the US international court, the journalists who wrote about the case, and the general public. Unfortunately, the Ethics committee declined to open the case because the alleged crime took place before Ayvazyan became an MP and before the introduction of current ethics rules which were introduced in May 2012. We are not pre-judging the former minister who clearly has the right to appeal his conviction, but what we would like is there to be transparency about the allegations and a way for the citizens of Armenia to hold their elected officials to account. That is the lesson here that we hope the political class will learn.